On the day the Great War ended, Sarah Field wrote to her daughter. 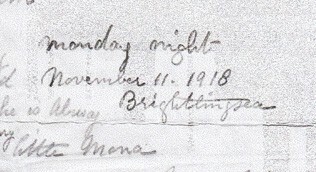 After her marriage, Lily had moved away from the family home in north-east Essex to Norwich; mother and daughter kept in touch through their letters. It's clear from the 600-word letter that Sarah hadn't had much schooling. The humble full stop makes no appearance, she was not overly fond of the comma, and 'my dear' seems to stand in as a natural break. Sarah had been born in Sussex, and her mother was from Liverpool; when Sarah was about 3 or 4, the family moved to Essex, so her phrasing and spelling display tinges of several accents and dialects. When writing about Spanish Flu, she says 'this dreadful complaint is about ant it awful so many people dying', and instead of 'February', she writes 'Feberday'. 'Ant' appears to stand in for both 'ain't' and 'and', and she says 'he go', 'he say', and 'someing' – standard English battles in her letter with the regional variations she had heard while growing up. Sarah mentions several family members in the letter. Her daughter Amy (my great-grandmother) appears, and there's her sons Harry and Willie, who had fought in the war. You may remember Willie, known as Uncle Bill to my grandma, from my previous blog post. Sarah's letter tells us that Bill needed a series of operations on his arm, probably due to a war wound. There's another son, too, in the letter: Ernest. Born in 1900, he had been too young for conscription. In the letter, 'Ernest is better he is calling off his club on tuesday that as made him look sadly' – whether this was Spanish Flu or something else, Sarah doesn't say, though of course she might have feared that it was. But then something leapt out at me about my grandma's Aunt Emily, something I'd never heard of before. Sarah had written, 'there is some very sad hearts to day for them that will never return i have thought about poor Emily i do wish poor Tom had been spared to come home to her.' Later in the letter, Sarah writes 'poor Emily, she is alway hard done bye poor girl.' All I knew about Emily was my aunt saying she'd moved to London, which is backed up by the 1911 Census For England & Wales, showing her in Lewisham where she worked as a general servant. So who was Tom? Her husband, or a fiancée? What had happened to him? And what happened, eventually, to Emily? Ernest and Emily were mysteries to me, so I decided to find out about them. Ernest was quite easy to track down, as he's the only person in the BMD index called Ernest Baden Powell Field. The Siege of Mafeking during the Boer War took place the year before Ernest's birth – clearly his parents were a fan of Robert Baden-Powell. There are two marriages in the index, both in London, which seemed to be his – one in 1931 to Kathleen M Robertson, and another in 1950 to Dorothy E Dunn. Using a search for births, using the father's surname and the mother's surname, I found a possible birth of a daughter for Ernest and Kathleen a couple of years after their marriage (I shall avoid naming her as she might still be alive). I assumed there would be a death for Kathleen between 1931-1950. Maybe, seeing as they lived in London, she had been a victim of the Blitz? But nothing in the index fitted. Maybe, seeing as they lived in London, she had been a victim of the Blitz? Rather than send off for two marriage certificates on spec, I decided to search for Ernest on the 1939 Register. A surprise awaited me. Although there's the possible marriage for him to Dorothy in 1950, in fact, in 1939, Ernest and Dorothy were living as man and wife in Wandsworth. Where was Kathleen? Where was their 'possible daughter'? I blinked at the screen. Surely this was wrong? Maybe it was a different couple – maybe another Ernest B P Field had arrived from somewhere else? I tried searching the 1939 Register for Ernest and Kathleen living in the same household, but came up empty-handed. I knew there was only one way to clear this up – so I sent off for the marriage certificates. I'm glad I did. It showed that both of these possible marriages were, after all, Ernest's weddings. First, he married Kathleen, then he married Dorothy. And at his second marriage, he was a divorcee – the marriage certificate gave his first wife's name and maiden name. I was curious about Ernest and Kathleen's 'possible daughter' , my grandma's cousin. Hoping for a clue, I sent off for Ernest's will. While I waited for the will, I tried to find Aunt Emily. 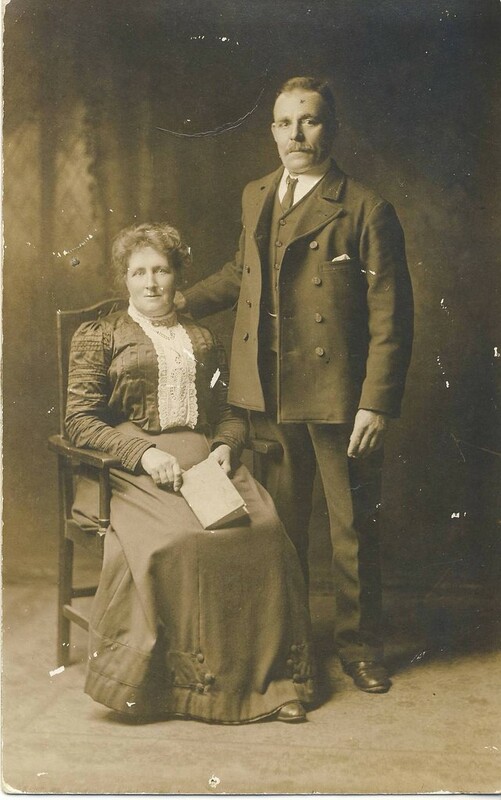 Her full name was Emily Jane, so I searched for a marriage of Emily J Field and a Thomas, between 1911 and 1918, but only one came up – in Bristol, in 1911. It didn't feel right. There was an Emily Field who married a Thomas J Mowforth in London in 1912, but would that be her if her middle name was Jane? And what if Tom had been her fiancée? What if Tom was actually a nickname and not his first name at all? So I looked for Emily in the 1939 Register. Thousands of women on the Register are called Emily J, so searching by first name and middle initial alone was fruitless. There was no Emily J Field that fitted, so I searched for just 'Emily J' and her exact date of birth. Six women came up in the results. None had the surname Field so I went through the marriage index, looking for grooms with surnames in the Register and an Emily J Field as the bride. But nothing matched Aunt Emily. There are two family group photos taken in the 1930s which feature Emily, but perhaps she had died before 1939? Maybe I'd have to wait for the 1921 census. And then Ernest's will arrived. There is no mention of second wife Dorothy in it; it seems she died the year before Ernest wrote his will. There is no mention of his 'possible daughter'. He names a brother and a sister of Dorothy, and then his seven siblings. Amongst them was Emily Hearne – at last, I'd found Emily's married name, and it matched one of the women with her date of birth I'd found on the 1939 Register. It's so easy to get hold of wills and certificates that reflect people's lives that we forget that genealogy is an act of snooping, and that sometimes we find ourselves peering into painful events. I had stumbled across the fact that Uncle Ernest's first marriage had failed, to the point that he ignores his own daughter in his will (if, indeed, he and Kathleen had had a daughter). Back row: Harry, Bill, Ernest and Charlie. Front row: Lily, Emily, Amy and Maggie. And what had happened? Had Kathleen left him, or had he left Kathleen? Did the divorce take a long time to come through, hence Ernest and Dorothy lived together as a married couple for at least 11 years before their own wedding? It doesn't seem that the Field v Field divorce ended up in the newspaper, and it's unlikely the legal papers survived. But then I asked myself – do I really want to know? Is it one act of nosiness too far? I think it might be. So it was time to move on from Ernest. I now had a married name for Aunt Emily, and, using the 1939 Register and a birth certificate, I would find four fatherless children and a grave in Ypres. But that story is for another time.